This last installment in our series on nanomachinery in the cell will focus on a microscopic power generator: ATP synthase. This machine resembles an energy-producing water wheel or windmill. But instead of making electricity, it produces ATP molecules (over 100 per second), the primary energy source for the cell. You may recall our discussion of the motor protein kinesin running on ATP energy. The rotor uses proton flow (like the water or air) to turn a drive shaft which then transforms the rotating mechanical energy into stored up chemical energy. A single human liver cell might have 2,000 mitochondria (called the energy plant of the cell). 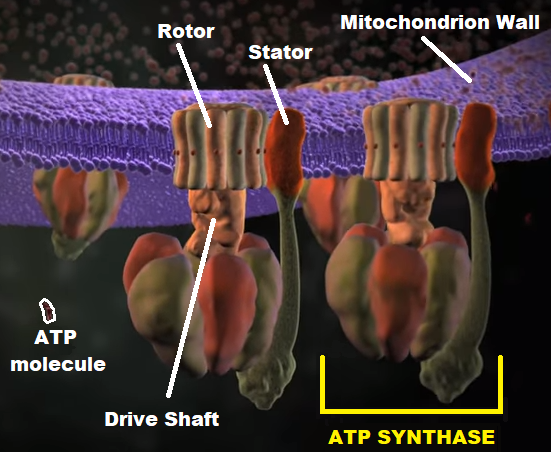 Each mitochondrion can have over 300,0000 of these ATP synthase machines embedded in it, all operating at near 100% efficiency. Each of these tiny biological turbines spin at over 9,000 rpm, producing the energy to run intracellular operations. The above graphic illustrates the mitochondrion’s outer wall with these amazing protein machines embedded in it. A wonderful animation is also available. The rotor, stator, driveshaft, etc. are all parts we recognize. If an astronaut discovered a complex machine like this operating on Mars, this design would be considered conclusive evidence of intelligent alien life. But what Designer made the wondrous biomolecular ATP turbine powering all of our cells? Posted on April 2, 2018 by dwoetzel.